Each week this time of year, I take the top off the bee hive and see where they are and inspect for anything out of the norm, parasites, etc. Much to my sadness today I discovered most of my bees were dead. 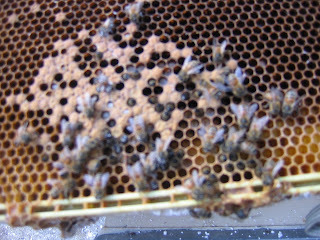 There were many baby bees, some about to emerge from their capped cells and bee larva present. 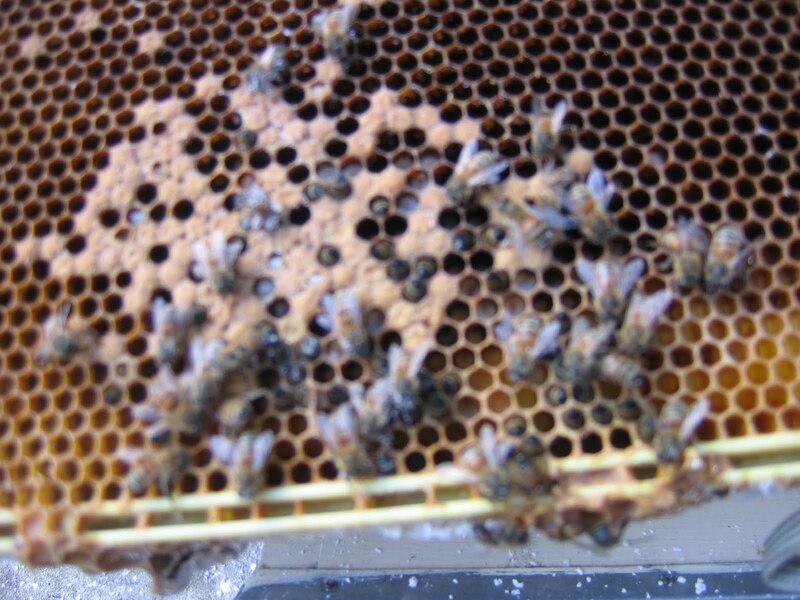 The queen lay right in the center of a cluster dead. A few weeks ago I noticed one bee had a mite on it and have been treating them with a powdered sugar method. The best I can tell is that my bees died from this parasite or possible use of pesticides in this area? Bees are such an important part of our enviorment and I beg all my readers to please not use them! These things are not only deadly to bees but leach into our food supplies as well as our water and contaminate the very enviorment that we hold so precious. Oh my dear how horribly sad. I feel about the environment as it seems you do and also urge people to avoid the use of chemicals whenever possible - they do much more damage to our fragile environment than they help. I have not yet started my own hive(s) but have wanted to for years, and now it seems that it is coming close to the time I finally will be able to begin. What with all the worries facing bee keepers these days, mites, africanized bees and so on it just makes me more sure that I want to keep bees to try and help preserve their existance, of course some honey doesn't hurt along the way :D Again, sorry about your loss and hope you can get your hive up and running again with bees happily flying in and out on their forays for healthy pollen for the hive and you! Thanks Beth for your comment, it's like I lost my kids!